A great 2-day sales course which teaches salespeople how to create strong and profitable sales relationships. How to use their Emotional Intelligence in Selling. This unique sales training course does this through salespeople learning the Empathy Styles model - how to quickly 'read' the personality of their prospects and customers. 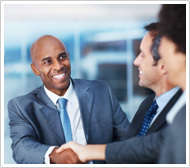 The sales course then shows them how to create a strong sales relationship based on that knowledge. Create the relationships then get the sales that others will miss. Learn the secrets of how to build successful business and sales relationships with buyers and prospects - even the difficult ones! This unique sales training course will show you how to adapt your sales approach to different personalities and you will therefore make more profitable sales. If you've been in sales for a while you probably get on with most people - you've learnt to adapt to other people's ways of doing business. But if we're honest there will always be people whom we don't get on with, or worse, they don't get on with us. If we're aware of that then we can work with it, maybe putting someone else in that account. But often we're not really aware of the poor relationship. Maybe we think we have a great relationship but still they don't buy?! Or maybe you'd just like to get in tune with people a little more, knowing how and why they're different, rather than approaching people as you've always done. This unique business training course will show you why that happens. And what you can do about it. It is an extraordinarily powerful yet simple concept that is easy to grasp, fun to learn and profitable to put into action. Sales managers and Sales Directors tell us that one of the challenges they face in training salespeople is how to transfer to their people their own experience of customers and prospects which they have gained over a lifetime in sales. This Empathy Selling Sales Course is the answer. You will have at your disposal a new set of skills to smooth the path to long-term profitable relationships with customers. Always salespeople will ask us 'how do I close?'. In this session we discover which close will work with which style. A truly valuable piece of knowledge. What's the financial investment? £575 plus VAT per participant - 10% discount available for more than one participant on the same course.